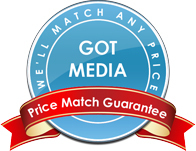 Microboards Technology offers their own line of low-priced Blu-ray media. Microboards BD-R offers great value at a low price point. Microboads has been a leader in recordable media solutions for recording, publishing and archiving your data, videos, and more on Blu-ray recordable media. BD-R Disc Optical Media uses state-of-the-art blue-violet laser technology to support high-definition television recording with excellent HD broadcast quality. Featuring storage capacities up to five times larger than today's standard DVDs and fast data transfer rates. BD-R Blu-ray Disc is also great for many other high capacity data storage needs. 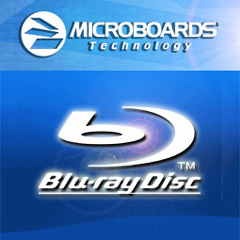 Microboards' Blu-ray media comes in 25-disc or 50-disc spindles and records at 4X. Featuring white inkjet-printable, silver lacquer thermal-printable, white Prism thermal, and white Everest thermal surfaces, Microboards Blu-ray media is compatible with all disc printers and disc publishers except the Pioneer BD-R101 recorder. Microboards Blu-ray offer excellent value. These BD-R have a white inkjet hub printable top surface for printing with a color inkjet printer or writing on the surface with a pen. Single layer BD-R, 25 GB, 4x. Microboards Blu-ray for Everest and Teac color thermal printers are an excellent choice where cost is a major factor. These BD-R have a white thermal hub printable top surface that is compatible with Rimage Everest and Teac color thermal printers. Single layer BD-R, 25 GB, 4x.